2015 November | Shake Rattle & Roll Dueling Pianos NYC | The Best NYC Dueling Pianos bar shows - all request Dueling Piano parties for Birthday, Bachelorette and more! This seems to be quite the busy week for our family of performers and big announcements. Now, Paul is back with his BEDBUGS! writing partner, Fred Sauter, and their new show, THE ASTRONAUT LOVE SHOW. It’s running this month in NYC, and if you use the promo code BUGLOVE, you can get 10% off your tickets. Go to: https://www.artful.ly/leschen-sauter-musicals-llc to get more info! Shake Rattle & Roll Dueling Pianos Team Member Heading to BROADWAY! Nothing makes us happier than a good prediction coming true. 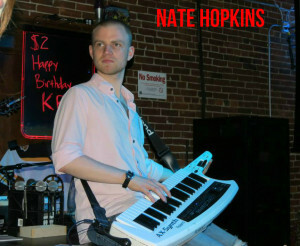 We’ve been saying to anyone that would listen, that our very own Nate Hopkins, dueling pianos wunderkind and acting phenom, would be destined for Broadway within two years. And it looks like our bet is on the money. Nate is now finishing up the regional production of THE BANDSTAND at the Paper Mill Playhouse in NJ, and it was just announced moments ago that the show will be transferring to Broadway in the 2016-17 season. Congratulations to Nate, and all the cast members, and break a leg!!! There’s a missing piano in New Jersey. And not just any piano. The piano that helped write BORN TO RUN, and other Bruce Springsteen hits. The year was 1974, and Springsteen was renting a cottage from “Landlordess” Marilyn Rocky. In the cottage was an upright piano the Boss used to write the tracks for the album that would solidify his career, Born To Run. After finishing the record and moving out, the entire band autographed the piano and left it for Rocky as a gift. Only, she never knew about the gesture. In 1995, when she cleared out the house prior to its sale, she found out one week too late about what the band had done for her. By then, the piano has been put out on the street and taken by a mysterious individual, it’s fate unknown. After the fact, she ran into E Street saxophonist Clarence Clemons, who informed her of what she had lost. Twenty years later, the house is back on the market again, and Rocky is hoping the renewed interest in the address will spark new leads in locating the lost piano, and giving her back her Glory Days. Shake Rattle & Roll Dueling Pianos Video Of the Week – HALLOWEEN! Shake Rattle & Roll Dueling Pianos Video of the Week! From our Oct. 31st HALLOWEEN show at The Cellar @ 22 Warren St. NYC, Greg Asadoorian gets the costumed revelers singin’ and dancin’ with Spice Girls’ WANNABE!